Beautiful M&S 51% WOOL Charcoal GREY JACKET. Length 22". MARKS & SPENCER PURE WOOL NAVY BLAZER WITH METAL BUTTONS SZ UK 10 STD. NEW WITH TAGS. ORIGINALLY £95. BOUGHT IN SALE FOR £65 POSTAGE RECORDED DELIVERY.PAYMENT TO BE RECEIVED WITHIN 24 HOURS OF CLOSE OF AUCTION.PAYPAL ONLY.NO LOCAL PICK UP. Condition is Used. Very good condition (see photo). Mark & Spencer Red Blazer 14 ***Petite*** ***Sleeve outside length approx 22 inches. Inside length approx 14 inches. *** Dark red colour. Condition is Used. **please note there are a couple of small marks under lower part of collar see photo 3 ** Double breasted with 6 military style gold colour metal buttons. 2 of the buttons fasten. I inside button fastener. 3 smaller military style gold colour metal buttons at each cuff. Two flap sealed pockets at sides. Lined bright green pure wool blazer. Colours are subjective and look different depending on device settings - the item you receive may not be exactly the shade you thought you saw. Treat yourself to this lovely smart black blazer jacket by Marks and Spencer. It would be ideal for smart wear. Length 30.5'. 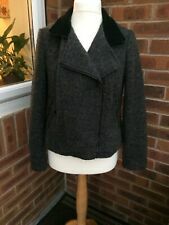 Ladies grey pure wool jacket size 10. Hacking style/blazer style jacket (M) would estimate at size 14. This was a double breasted jacket, that was altered to 1 button style, with nice buttons on sleeve/jacket. Good gold coloured lining - no stains, but it does have a small hole (that isn't visible upon wearing) - see photo 8. Smart black 100% pure New wool blazer with ornate gold coloured buttons ,double breasted, standard fit . From Mark's & Spencer's, size 16, New without tag. 18" across shoulders, 21" across chest armpit to armpit, 19" across waist, 31" in length shoulder to hem, 16" armpit to cuff. From smoke free home. Sorry returns not excepted. A Vintage St Michaels Blazer Wool fabric fully lined In immaculate condition Black wool outer with gold metal buttons A boxy straight cut double breasted blazer wth shoulder pads Label states 16 Petit but with Vintage clothing the size is not accurate to todays measurements so I have added measurements Measurements taken laid flat on a surface on one side Chest pit to pit 21" Arm shoulder seam 22.5" Length Collar seam at rear to hem 26.5"
MARKS & SPENCER. PIT~PIT 42". FULLY LINED. LENGTH 29". DOUBLE BUTTON. CHEST 38"~40". WHITE CHECK. SHOULDER 24". Authentic Marks and Spencer. Gorgeous fully lined and semi fitted pure wool blazer with gold button detail (spares attached inside). in immaculate condition. 18. bust 22 ins. Ladies red marks and spencer jacket size12. Lovely jacket never been worn pockets in the front smart with jeans or a dress. Marks & Spencer-original hacking country jacket. Pure new wool and fully lined. Recently dry cleaned. Beautiful original jacket that is smart, classic and sophisticated. Dark navy blue in pure new wool and fully lined. Fastens with gold buttons (spares attached). VINTAGE ST. MICHAEL BLAZER WITH GOLD BUTTONS DARK GREEN DOUBLE BREASTED WITH 6 BUTTONS DOWN FRONT, PLUS 3 ON EACH SLEEVE, PLUS 2 SPARES 2 SIDE POCKETS WITH FLAPS, TOP POCKET, SATIN LINING UNDERARM-UNDERARM 22" (56cm) LENGTH 30" (77cm) VERY GOOD CONDITION FROM A SMOKE AND PET FREE HOUSE Please pay within 24 hours of the auction ending up please as this allows me to get the item posted as soon as possible due to work commitments. Size UK 10. Great quality. Single breasted button fastening. Front patch pockets. Classic fitted style. Long sleeves. 60 cm from shoulder to cuff. 44 cm from underarm to underarm. The body sections are perfect but each sleeve has a small Moth Hole. The sleeves could be taken out and converted into a Gillet if you are really clever. Mauve purple M & S short edge to edge tailored jacket size 12 - BNWT. 3/4 sleeves detailing as picture. Spare button inside. Fully Lined. Lovely little jacket. Double breasted. Armpit to cuff : 24". M&S new Green Wool Blazer 14. Fitted blazer. Fab jacket from M&S Woman. 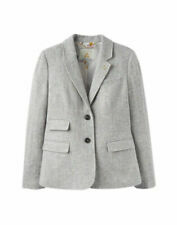 Lovely smart classic jacket in grey. Viscose with wool mix. Fitted. Single button fastening. 3 buttons at the wrist. New with tags. Grab a bargain. Payment expected within 5 days of end of sale. Always happy to combine postage so see my other items. Collection also welcomed using cash on pickup. Feel free to ask anything else. 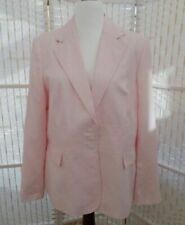 Baby Pink 100% Wool 60s Style Clueless Blazer Jacket Boucle Size 16 Trending. Condition is Used. Good condition Wool Boucle style Detailed buttons Pockets on front Great for spring Approximate measurements laid flat Underarm to underarm 22 inches Shoulder to shoulder 17 inches Shoulder to hem 23 inches This also comes with skirt sold separate on my eBay store. Beautifully tailored, fitted shape. Hip length. 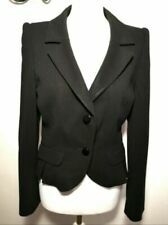 An outstanding ladies blazer / suit style jacket by M&S LUXURY Collection. Fine quality wool rich fabric in a plain navy blue. 86% new wool, 9% polyamide, 5% elastane. Marks and Spencer Portfolio. Wool blend. Lining Polyester. Length 27". Sleeve 24". 20% Polyamide. Underarm to Underarm 20". Marks and Spencer Autograph Weekend blazer jacket. Fabulously on trend St Michael jacket in black and cream plaid with interesting brass buttons. Fabric is 100% lightweight wool, fully lined and condition is pristine! Size 12 measuring 18" armpit to armpit and 30" long from underneath the collar to hem. Looks great on a size 8/10 also for that "boyfriend" fit. I’m an 8 for reference and 5’8. Superb quality, made in South Africa. Long sleeves. Light padding to shoulders. Gorgeous jacket by M&S. A lovely chunky knit style jacket with adjustable neckline - wear higher or lower for different looks. Marks and Spencers St Michaels dark grey jacket with 80% wool, 10% cashmere, 10% polyamide. Velvet collar, pockets and buttons to cuffs. Size 16. Measure 38" chest, 34" neck to hem, shoulder tip to cuff 24". Excellent condition. Double breasted style fastening with gold buttons to fasten. luxurious aubergine and green check blazer in 100% pure new wool. M&S Blazer Jacket. SIZE UK 16. 21" underarm to underarm. full length sleeves with buttons on the cuffs. M&S Autograph BNWT - RRP £99 - size 12. Navy single breasted blazer with contrast top-stitch, 2 patch pockets, fully lined. Tailored nicely with shoulder pads for a flattering silhouette. luxurious 100% pure new wool jacket. M&S Blazer. fully lined in silky fabric. 29" nape of neck to hem. 20" underarm to underarm. Marks & Spencer Black Wool Ladies Jacket. 100% Wool LINING 50% Acetate 50% Viscose. In good clean preowned/used condition. Size: UK 12, EU 40, US 8. Waist: 16". Length (shoulder to hem): 21.5". FANTASTIC MARKS & SPENCER DARK BROWN PURE NEW WOOL BLEND SMART JACKET Size 12 ! !